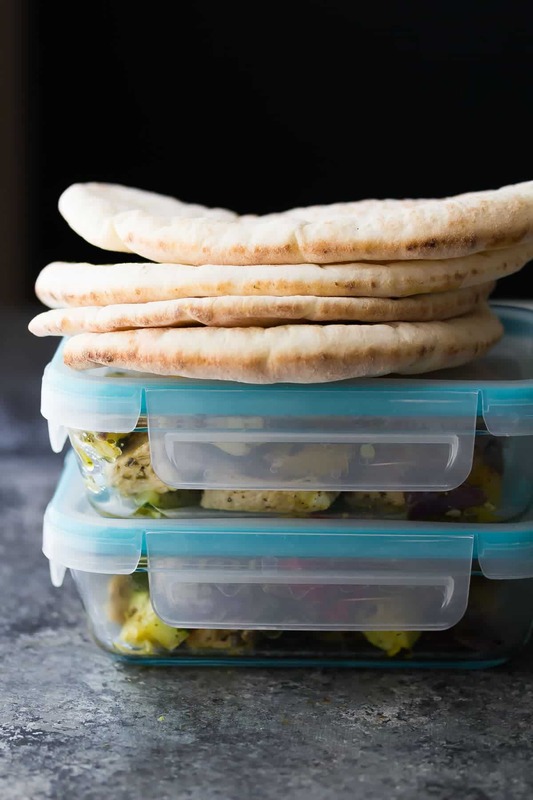 These meal prep pesto chicken pita pockets will be the envy of your office! 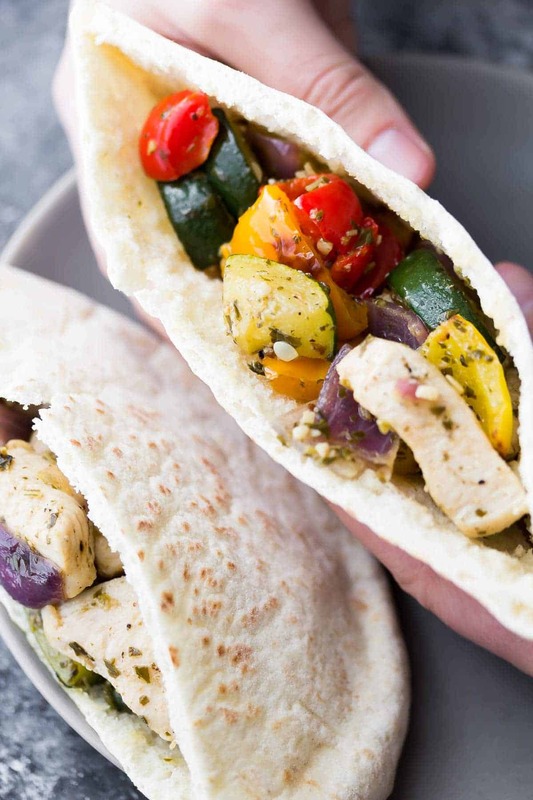 Roasted chicken and veggies are tossed in pesto and served in a pita pocket. Nutritional Information: 2 pita pocket halves + ¼ of filling To make grain bowls (per portion): serve the roasted veggies & chicken (no pesto) over ⅓-1/2 cup cooked grains (farro, rice, barley or quinoa) with ½ tablespoon crumbled feta cheese and 1 teaspoon balsamic reduction. 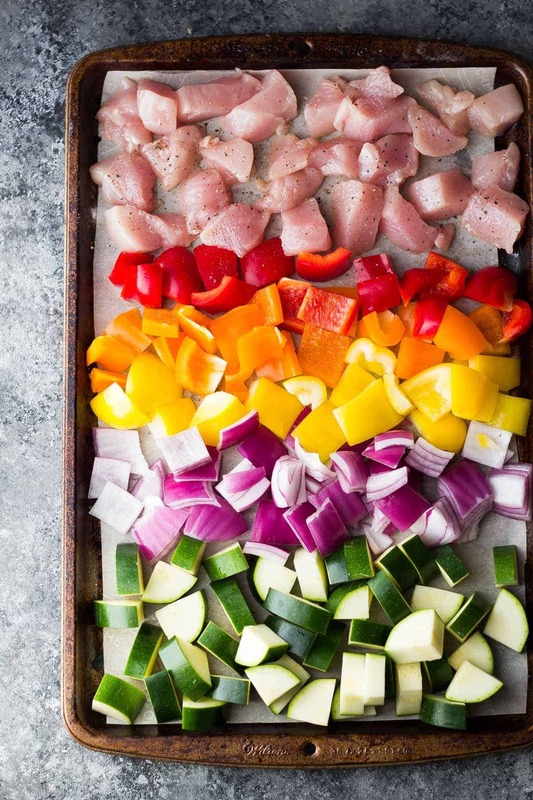 Do you cook for the full week and leave it in the fridge? Hi Rebecca! Only for 4 days in the fridge. After that the chicken is not safe to eat. Hope you enjoy! Would the filling freeze? 🙂 Thanks! Hi Helen, I don’t recommend freezing roasted veggies as I find them to get quite slimy upon thawing. It doesn’t bother some people but I don’t care for it. I just came across this recipe and must make it soon! Do you have a brand of pesto that you’d recommend? Thanks! Amazing, this is really mouth watering just looking at the photos. Definitely, would try this weekend. Looks really tasty. thank you so much for sharing this awesome recipe with us. I hope you enjoy the recipe, Dustin! How many calories without the pesto? Hi Marissa, I don’t have the nutritional information for this recipe yet, but you’re welcome to input it into a calorie calculating site like My Fitness Pal. I’m salivating here using pesto. Do not wait to make this to the weekend. Right now, I’m still busy with work but who knows I sneak a while visiting the grocery store and get some components. can you reheat the filling before placing in the pita pocket or eat it cold? Thanks! 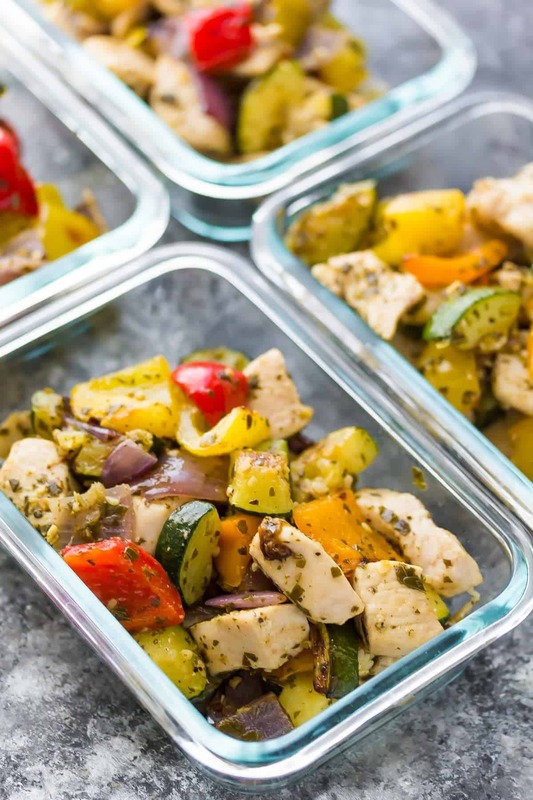 Loving your meal prep thoughts, have pinned a number of them to test out shortly! I enjoyed mine with the filling heated gently, however you could also eat them cold 🙂 Thanks so much! Do you reheat the filling before putting in the pita pocket or eat it cold? Thanks! 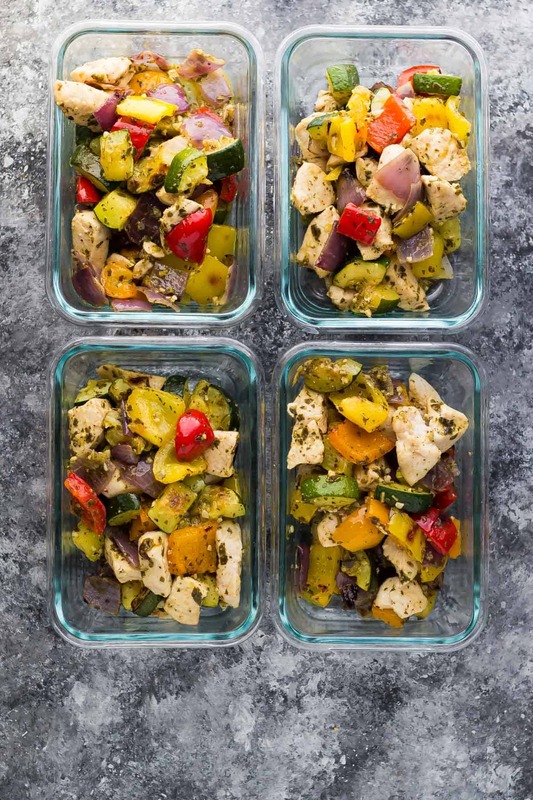 Loving your meal prep ideas, have pinned many of them to try out soon! Hi Kate, yes you can definitely do that! I enjoyed them warmed up or cold. I am salivating here with pesto. Can’t wait to create this on the weekend. At the moment, I am still busy with work but who knows, I sneak some time going to the grocery and buy some ingredients. I hope you enjoy them, Taylor! I just made this and ate it for lunch… DELICIOUS! I did add red pepper flakes and cayenne pepper for a spicy taste. Awesome, I’m so happy to hear that you enjoyed them, De! Just made these for dinner! I added Feta Cheese, yum! Family loved them and they were so easy. I felt like our chicken dishes have been boring so this was a fun and new change! Thanks! Delish! You had me at pesto! Anything with pesto is a winner in my book, especially if it involves pita pockets. This reminds me of a sandwich that my Grandma used to make. Looks so good, Denise! I LOVE pesto, and would be happy eating this filling any which way! 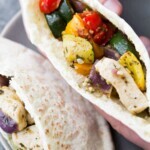 The pita pockets sound delicious and would make THE perfect lunch!